At long last, another post! 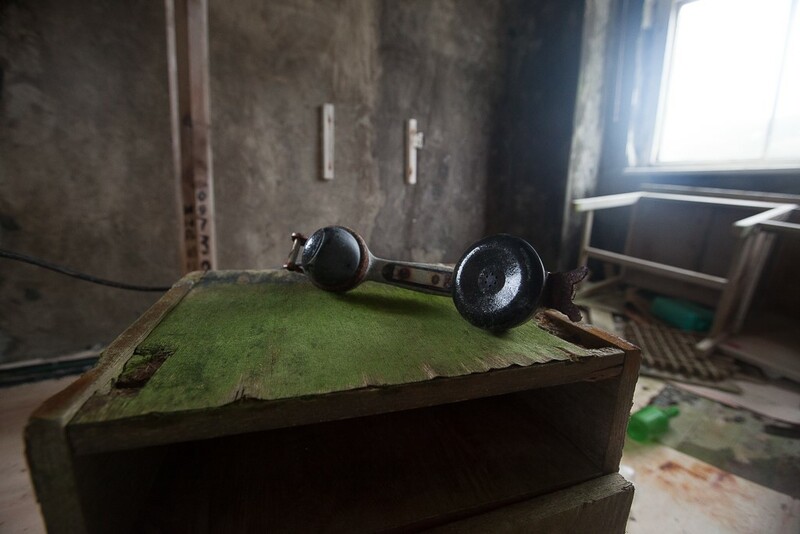 This time about my recent trip to the Russian Far East, the Kamchatka peninsula, the Commander and Kuril Islands and Sakhalin in the Sea of Okhotsk – the so-called ‘Russian Ring of Fire’. 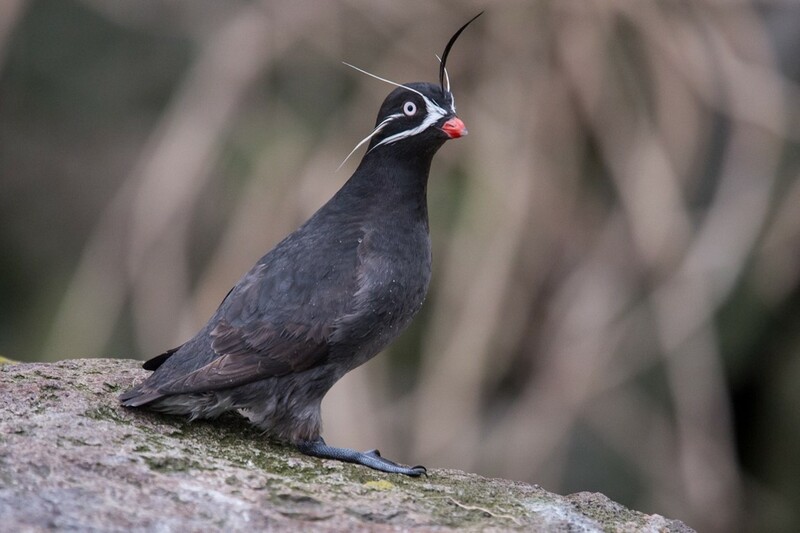 Getting to see the avian gems of the north Pacific has taken some time. In 1996 on my trip to Arctic Siberia trip we were delayed for four days on the north coast and had to completely abandon our visit to the seabird megacities of the Sea of Okhotsk and last year this trip, run by Heritage Expeditions, was cancelled due to Russian intransigence over the Ukraine situation. 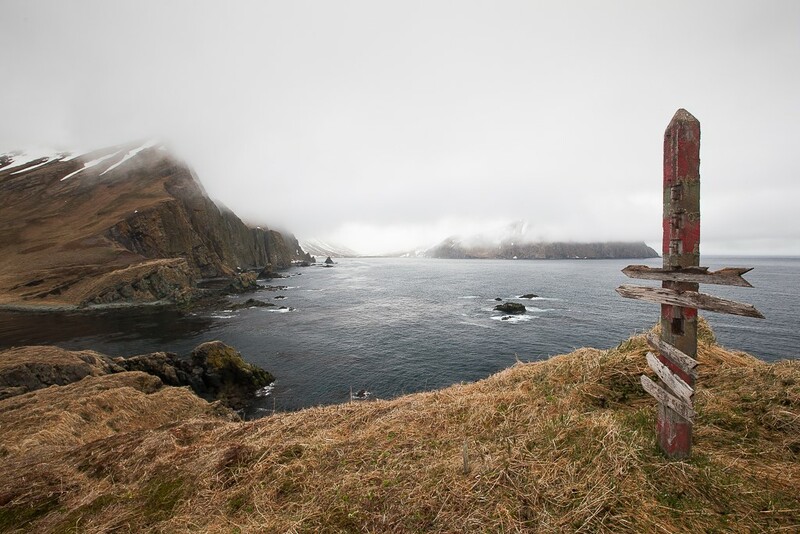 Its taken 20 years, but at long last I have visited this wild part of the world and seen it’s amazing wildlife. Of course I didn’t plan to go on two cruises just a few weeks apart, but with last years cancellation that’s the way it worked out . One thing that strikes you is how lucky we are in the UK with our climate, The northernmost point of the cruise was on the same latitude as northern England, the southernmost point is level with the French Riviera, but for part of the time, even in June, we had snow on the ground at sea level and had fog, gale force winds and temperatures that seldom rose above 5 – 10c. 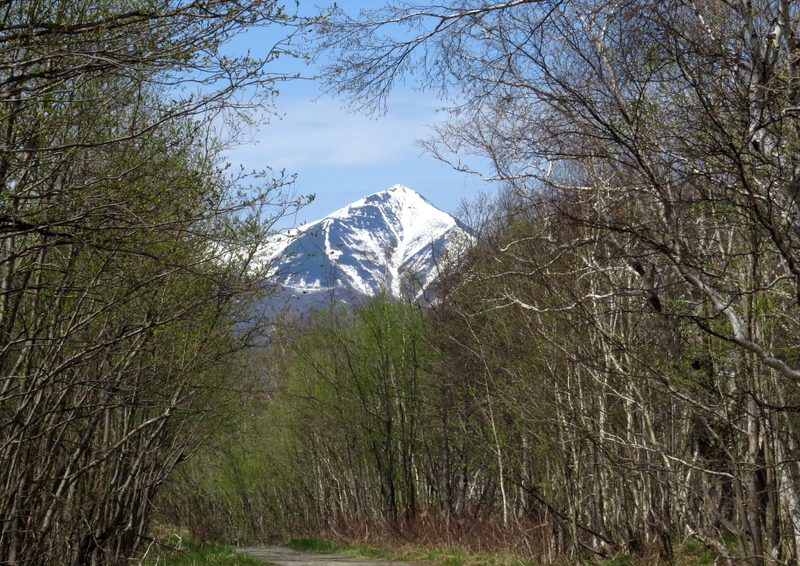 At sea level in Kamchatka birch trees were just coming into leaf, but ascend 100m and they were still bare and many migrants appeared not to have arrived. This post is just a summary of the trip, as I still have most of my photos to edit. At its conclusion we were given a Powerpoint presentation prepared by a member of staff. All photos in this post, except those labeled with my name, are taken from this presentation. Although each picture cannot be individually credited (as this information was not supplied) the photographers whose work has been used are: Lisle Gwynn, Leonid Kotenko, Meghan Kelly, Chris Collins and Katya Ovsyanikova. Travelling across 11 time zones took ages, especially as there was a 13 hour wait between flights in Moscow. We arrived on a rare perfect day at Petropavlosk-Kamchatskiy (universally abbreviated to PK). We birded the birch forest that surrounds PK. 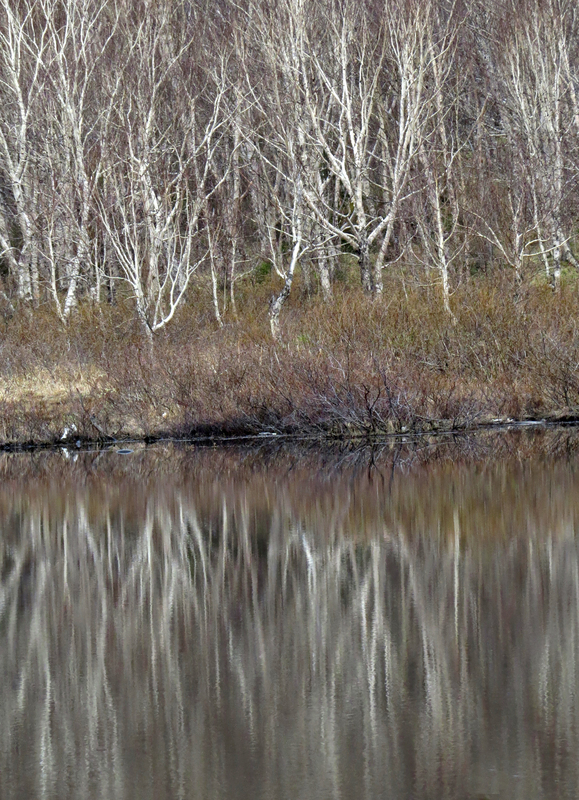 The birch forest was just coming into leaf …. …. but you only had to ascend about 100m and the trees were still bare. The prime avian target was the very elusive Black-billed Capercaille. We eventually all saw a female, but for me at least, it was under extremely frustrating circumstances. In the evening we set sail on Heritage Expedition’s ship, the Professor Khromov or Spirit of Enderby as they call her, into Avacha Bay. 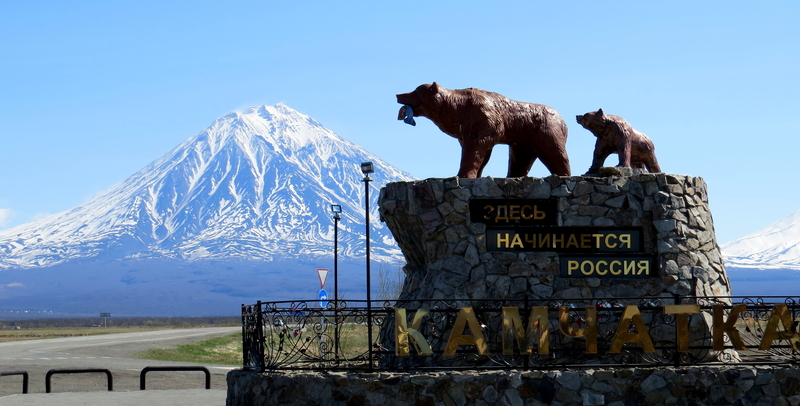 Pk is the central marked point on the Kamchatka peninsula. 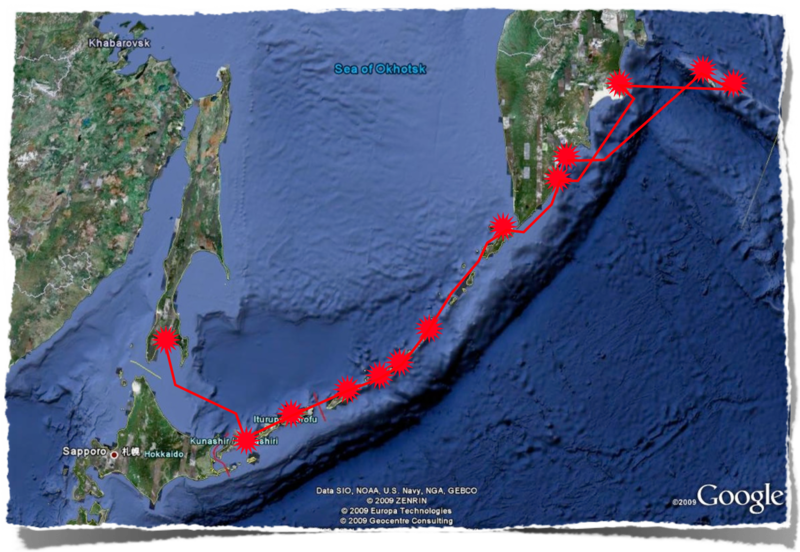 From here we sailed north to the Commander islands, back to two more locations in Kamchatka, visited seven islands in the Kuril chain before crossing the southern Sea of Okhotsk to Yuzhno-Sakhalinsk on the island of Sakhalin. The Sea of Okhotsk is very cold whilst the NW Pacific receives warmer water from the tropics. The result is fog, grey skies and bad weather. Even though the sun seldom shined once we left PK, we had calm seas and great wildlife viewing such as this flock of Red-necked Phalaropes on a glassy ocean. 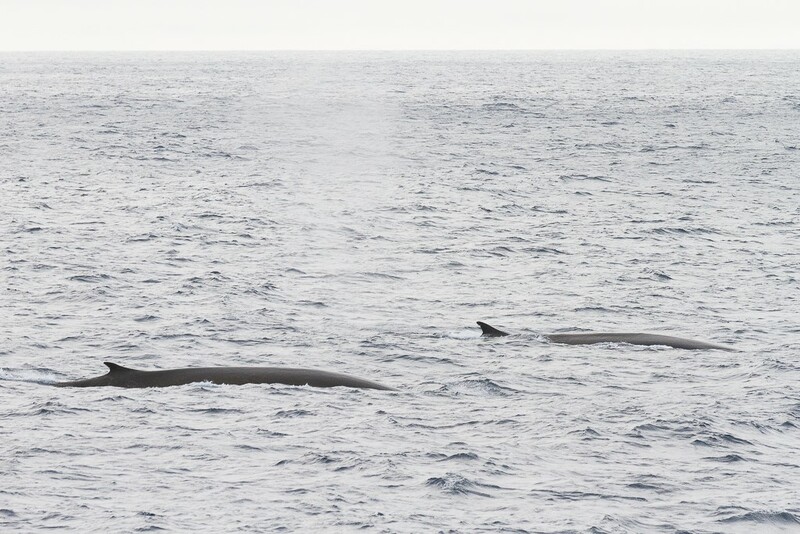 On the trip we saw four Blue Whales, two Fin Whales (above), Humpback Whale, many Sperm and Killer Whales, Baird’s and Stenejger’s Beaked Whales and Harbour and Dall’s Porpoise. We made three landing in the Commander Islands, the most easterly of the Aleutian Chain and the only ones not to belong to the USA. The islands are named in honour of Commander Vitus Bering who led the first expedition to explore these waters and died here after a shipwreck. A short climb took us to North-west Cape where lo0king over a cliff ..
…. we had good views of Red-faced Cormorants …. …. 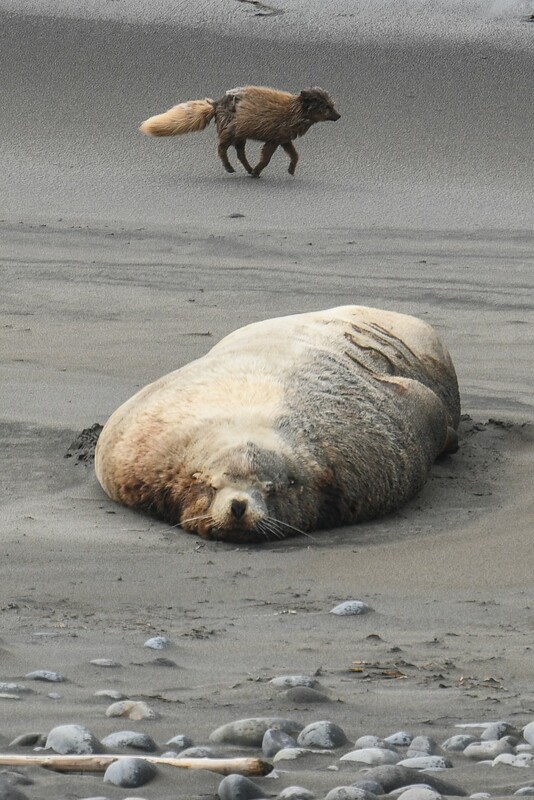 and some enormous Steller’s Sea Lion bulls (the fourth biggest pinneped in the world) with an inquisitive Arctic Fox as a bonus. 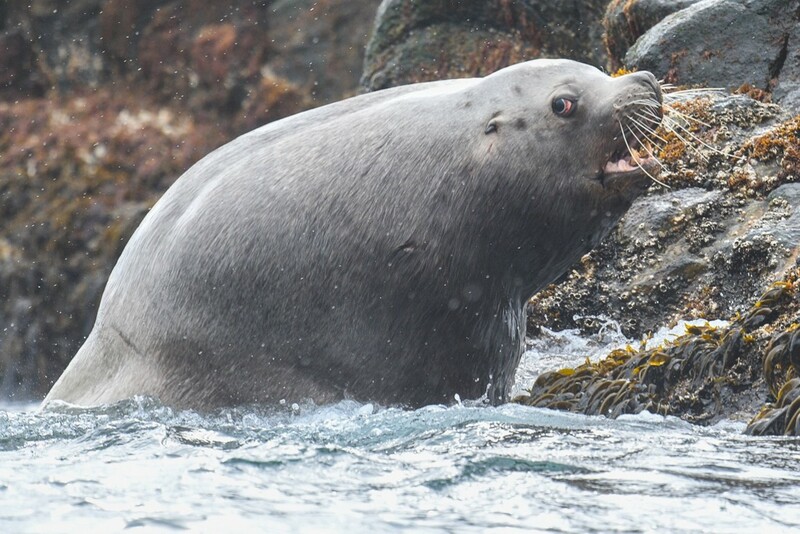 There were also large numbers of Northern Fur Seals in the area. 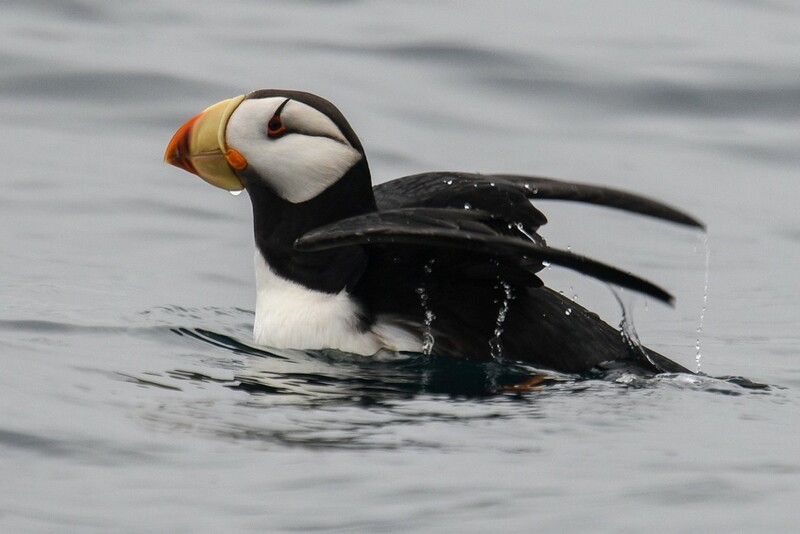 A visit to an offshore stack in the zodiacs gave us views of Horned Puffins …. …. 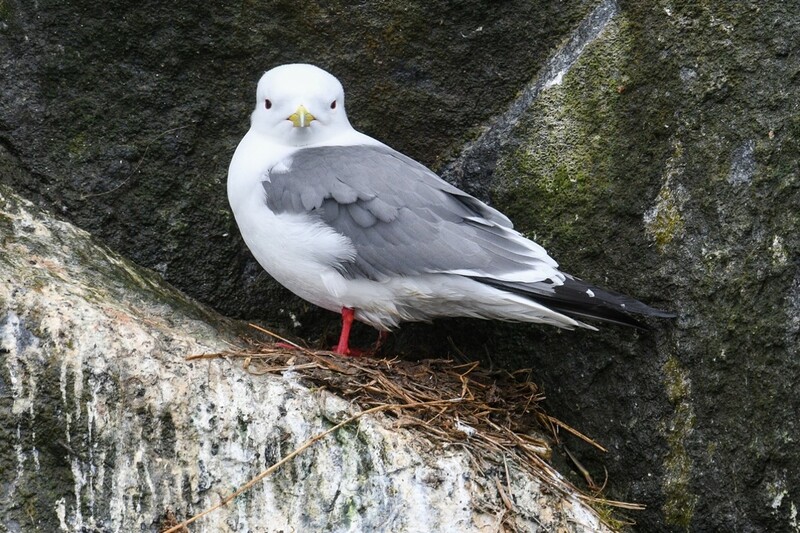 and the enigmatic Red-legged Kittiwake, a gull confined to the Aleutian chain. A wide-angle view of the island of Medney, although I never saw it from this angle as I was birding along the shoreline of the bay. 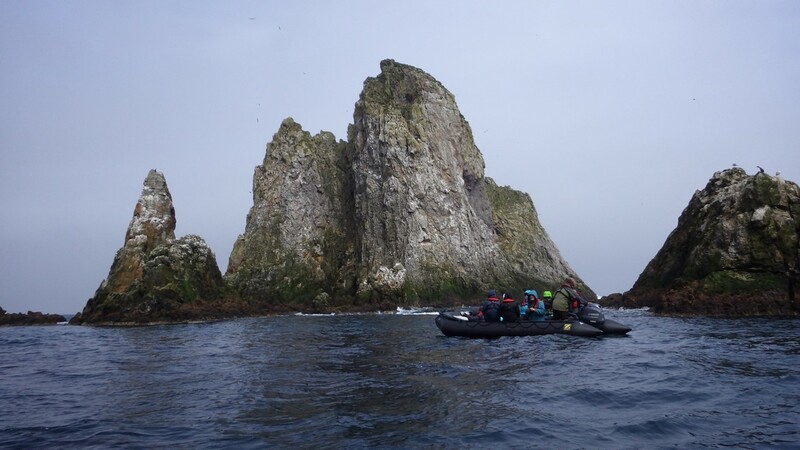 After birding/exploring the bay we took a zodiac cruise along the spectacular shore line. 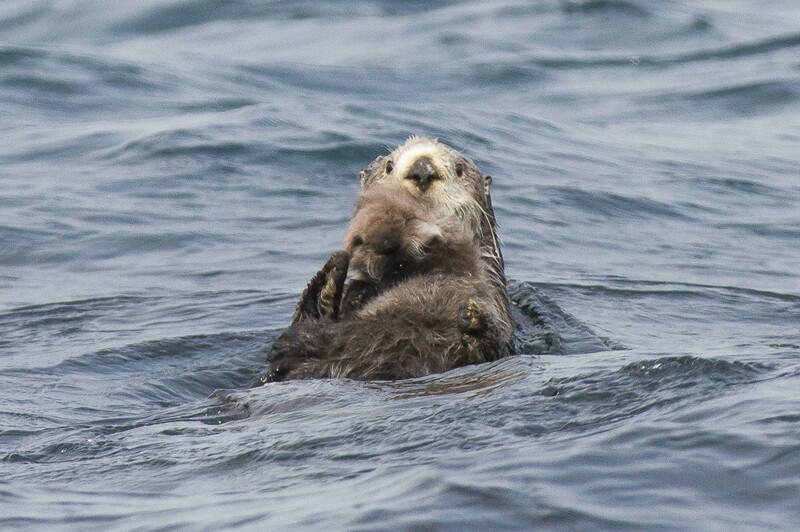 There were plenty of Sea Otters, many with a little cub resting on their bellies. Most of the passengers were from Europe, North America or Australia but we also had four Russian tourists who could always be identified by their bright red jackets. 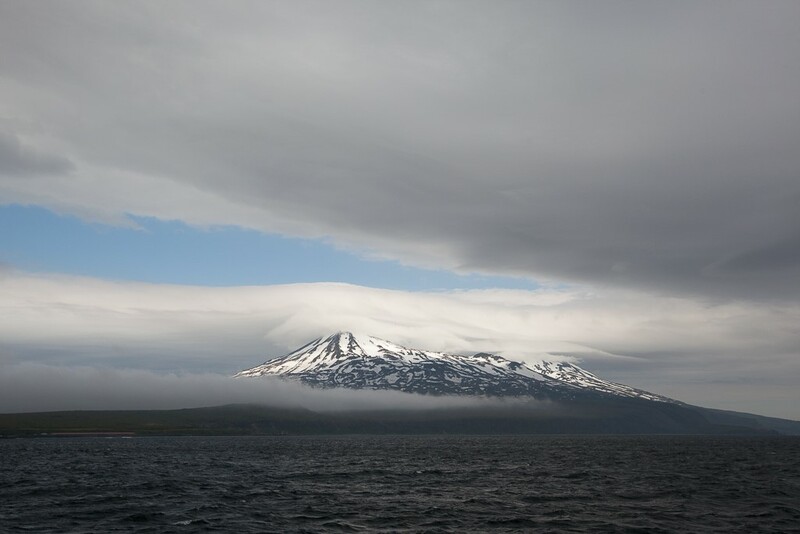 Overnight we sailed back to Kamchatka. 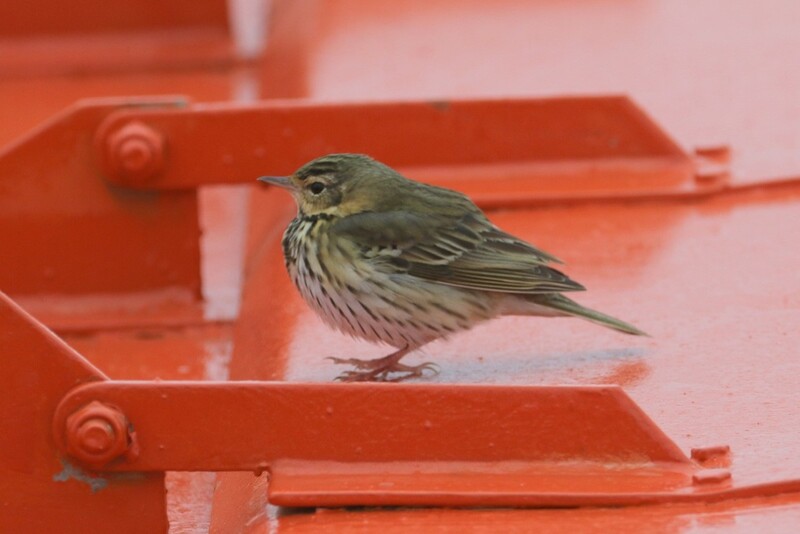 Dawn was wet, with low visibility, quite a few migrants came aboard the ship, including Brambling, Eastern Yellow Wagtail and this Olive-backed Pipit; seeking refuge, appropriately on the lifeboat. 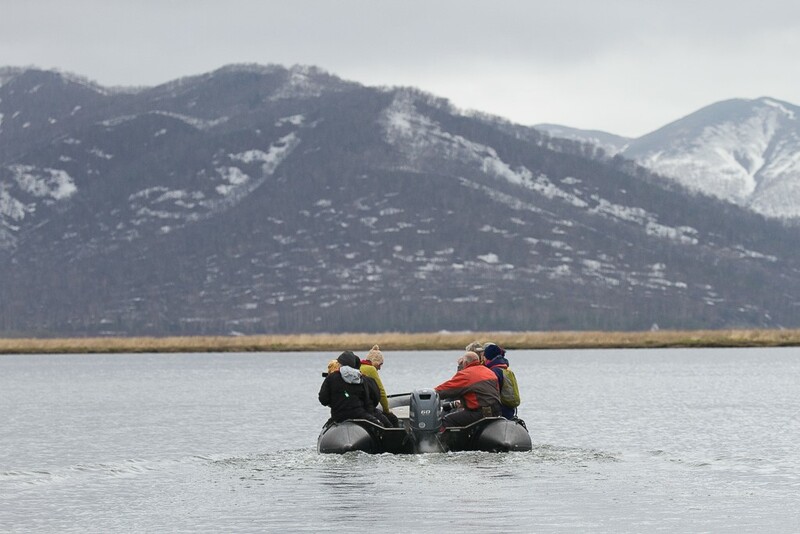 Conditions improved as we zodiaced ashore and headed inland up the Zhupanova River. 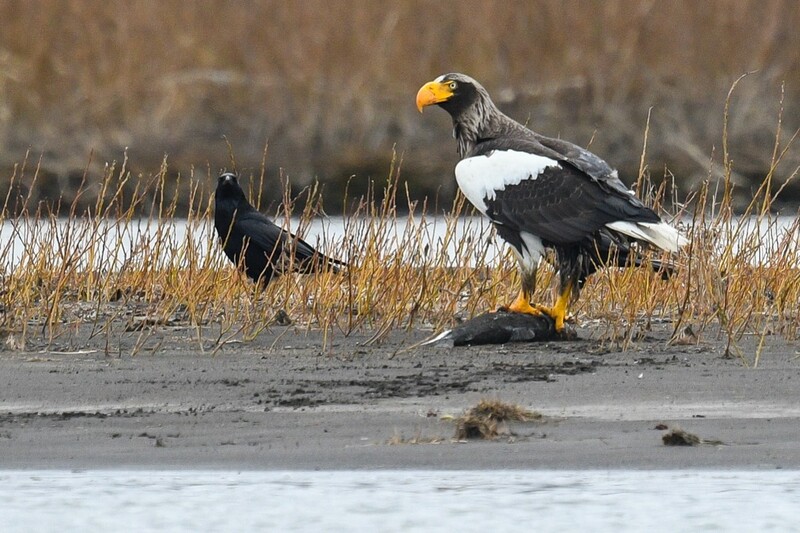 Our main target was the enormous and magnificent Steller’s Sea Eagle, here seen feeding on a salmon. Compare its size with the adjacent Carrion Crow. 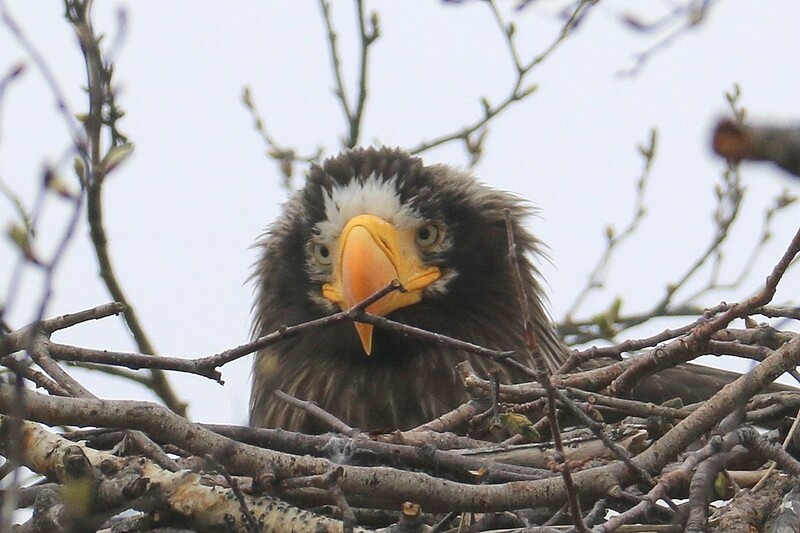 Several pairs of Steller’s Sea Eagles nest along the river. With the zodiacs it was possible to get quite close without disturbing them. The leader’s 500mm lens with 2x converter helped as well. 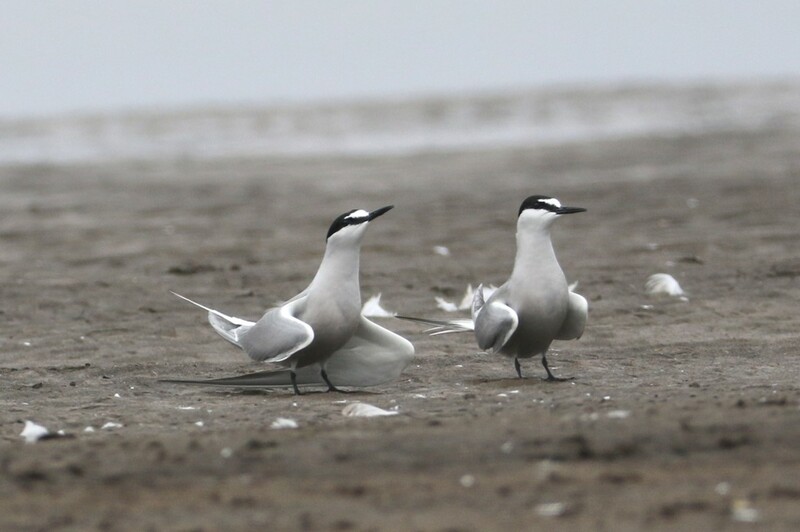 We returned down the Zhupanova River and spent some time near the mouth looking at terns. 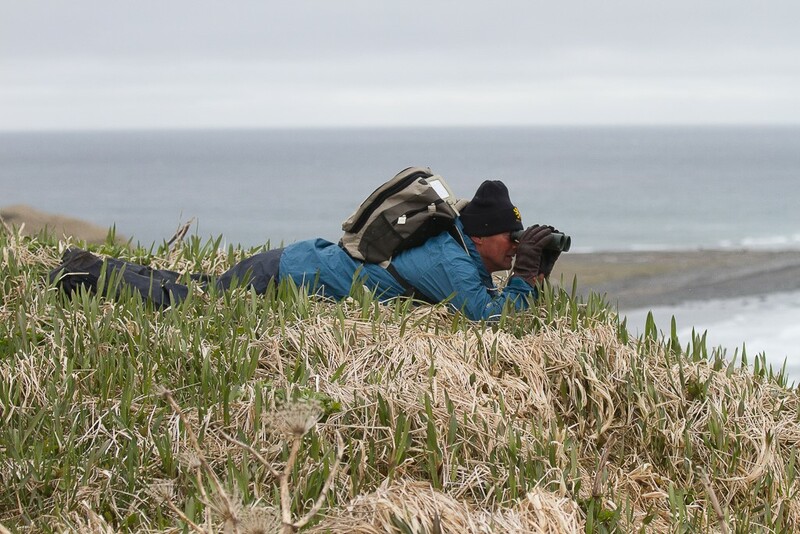 It didn’t take long to find our target, the range restricted Aleutian Tern, which calls more like a wader than tern. As this species has occurred in the UK (once) I was delighted to see it, as it my ambition to see every extant species on the British List (just one to go now). 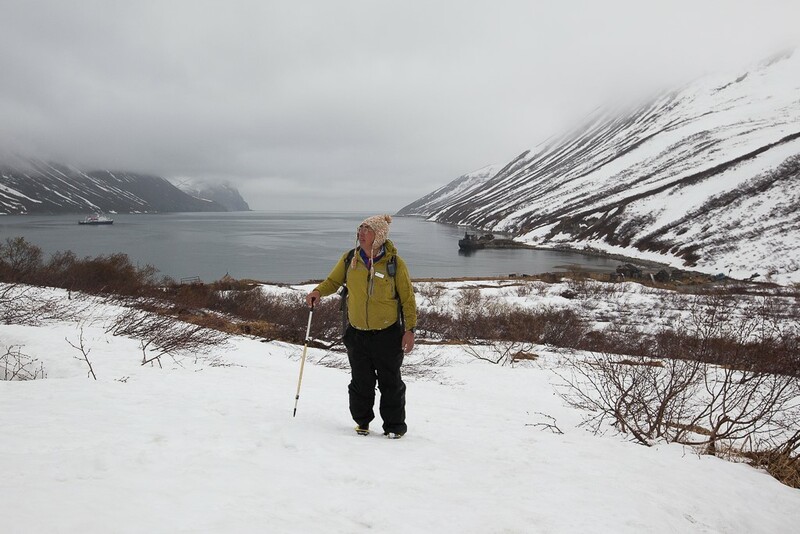 The next day we went ashore at a fjord near the southern tip of Kamchatka, in spite of the fact that it was already June and we were at the same latitude as London, the ground was covered by snow right down to sea level. After some good birding we returned to the ship and at the mouth of the fjord I picked up this Brown Bear on the snowy slopes. It was at least a mile away but I got some record shots. 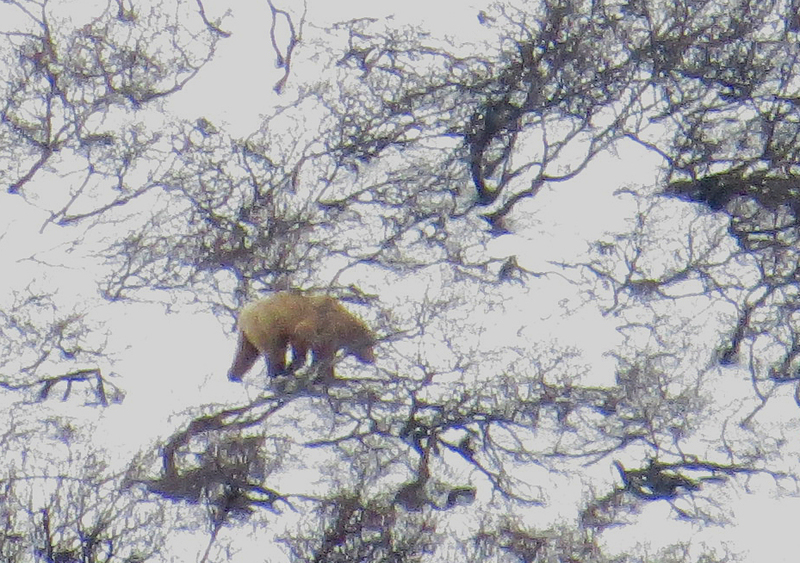 The colour made it look more like a Polar Bear than a Brown Bear. The only other one we were to see at Kunashir in the far south of the Kurils looked more like an American Black Bear in colour! 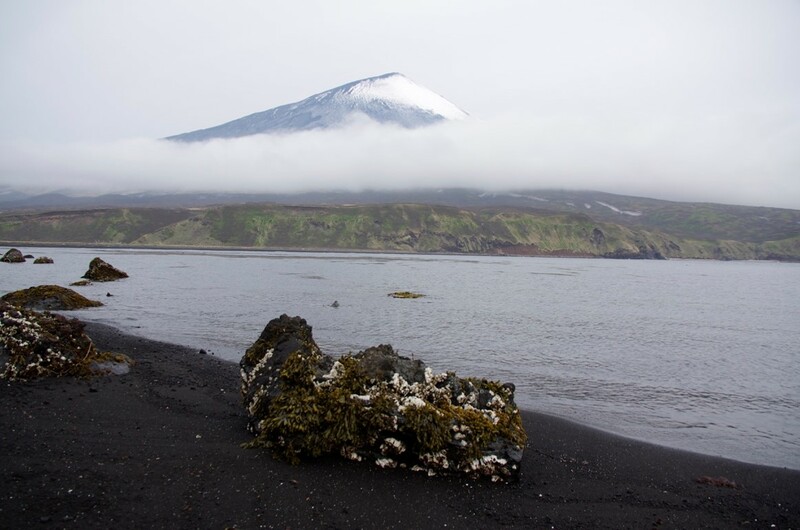 Our next stop was at Atlasova, one of the northernmost of the Kuril Islands. Here we had a real surprise, a Red-billed Starling, a species that was a mere 4000 km out of range! The deep trench off the Kurils is known as a good location for Killer Whales or Orcas and they certainly didn’t disappoint with up to 80 individuals seen. We heard that a cyclone was coming but we didn’t know just how bad. 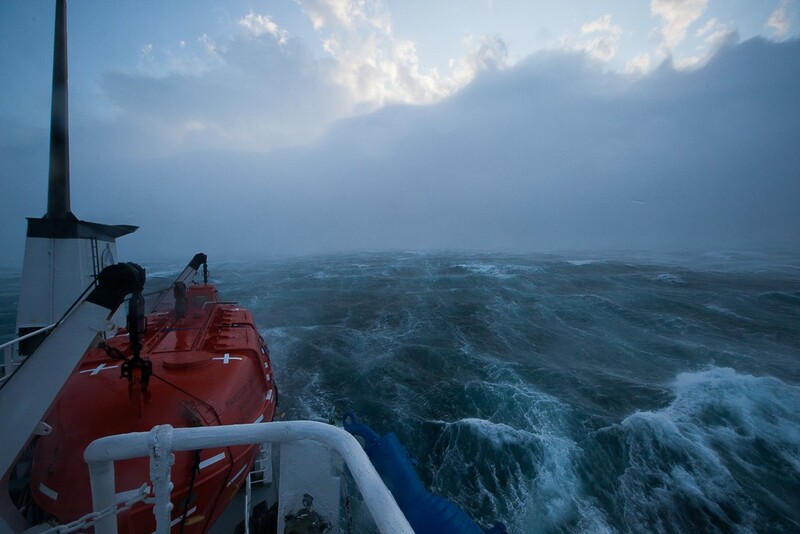 That evening the winds gusted over 80 knots (that’s 160 km/hr). Unable to anchor the ship took shelter in the lee of the island of Onekotan. Of course we couldn’t make a landing that afternoon and we weren’t able to make any landings the following day either. On the third day of rough seas, a brave attempt was made to get us ashore inside the flooded caldera of Simushir Island. However as can be seen from this photo the swell was still pretty bad and I nearly fell in the sea trying to board the zodiac and got soaked up to mid-thigh. 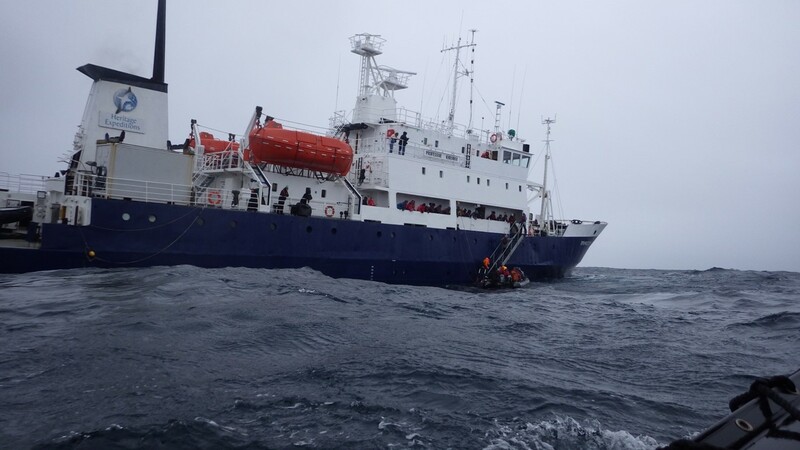 The attempt to board the zodiacs was aborted and the ship steamed about 5km to a new location whilst we followed, bumping along in the zodiacs. By the time a more sheltered location was found I was very cold and had no alternative but to re-embark and get thawed out. Most of the others in the zodiacs stayed and many more still on the ship joined them, but it was now a hour’s ride to the caldera and an even longer journey back. Those that made it to Simushir and its former secret Soviet submarine base said the expedition was worthwhile and quite enjoyable, but they returned cold and wet several hours later. 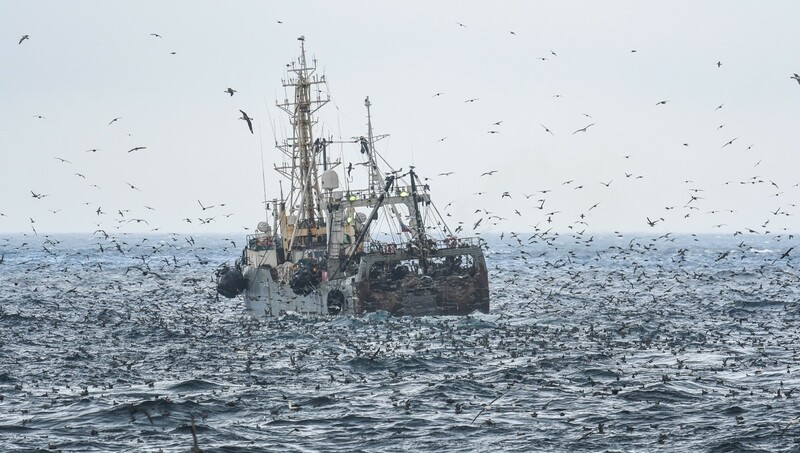 The number of seabirds in these waters is staggering, Fulmars and Laysan Albatrosses swarm around a trawler, there was another trawler about 2km away and the flock extended as far as the second boat. Estimates of the number of birds present varied from 100,000 to half a million. Heritage Expedition have done this itinerary at least a dozen times. They usually see one or two of the mega-rare Short-tailed Albatrosses per trip (but have missed it some years and there is no guarantee that any one observer will connect). This year we saw 14! 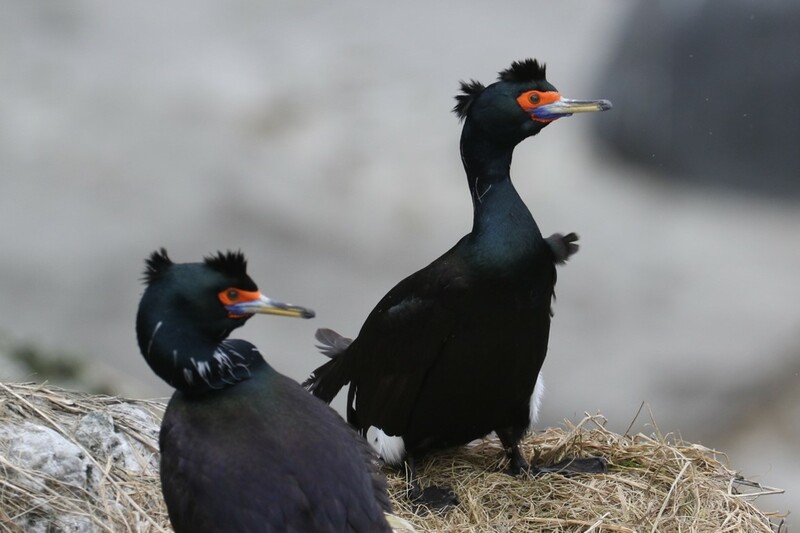 The storm may have prevented some landings but it delivered quality seabirds. Short-tailed Albatrosses were hunted to the point of extinction on their only breeding island (Torishima, off southern Japan) in the early part of the 20th century for their feathers. It was only because there were a number of immatures still at sea that the species survived. The population now numbers a couple of thousand but they wander over a huge area of ocean and we were very lucky to see them so well and so often. 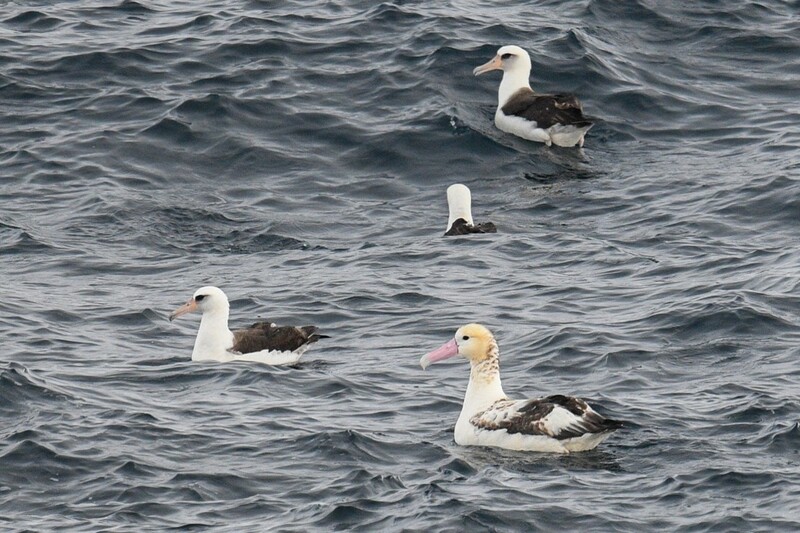 Even better was the sighting of a couple of adults, one seen here is with smaller Laysan Albatrosses. 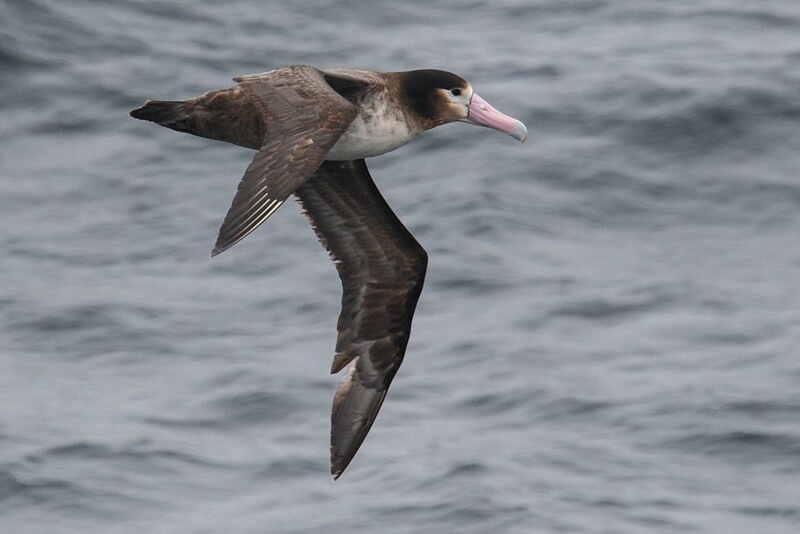 The name ‘Short-tailed’ doesn’t do it justice, ‘Golden-headed’ would have been better, or perhaps Torishima Albatross. For all of the birders on board (and most of the non-birders too) the highlight of the entire trip was the evening visit to Yanchika Island. Fortunately the swell had subsided enough to let us enter another flooded caldera, complete with its hot springs and fumaroles. 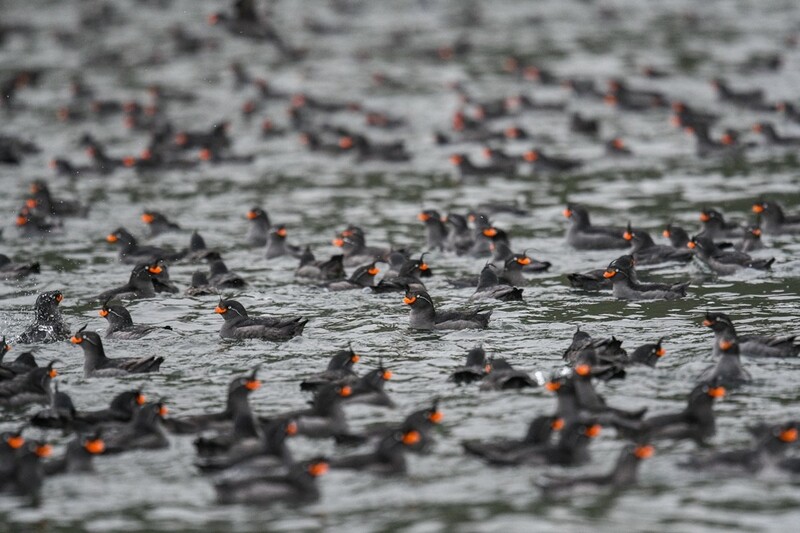 On the way we saw prodigious numbers of Crested Auklets …. …. 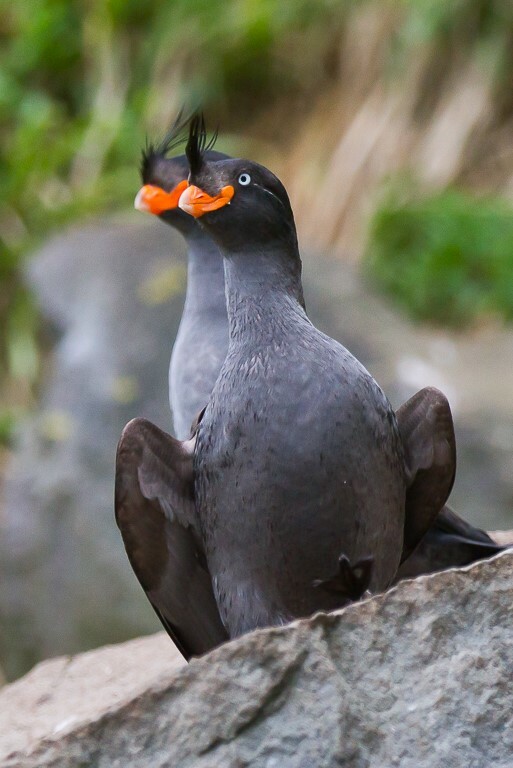 and the exquisite Whiskered Auklet, surely the most charismatic of the auk family. 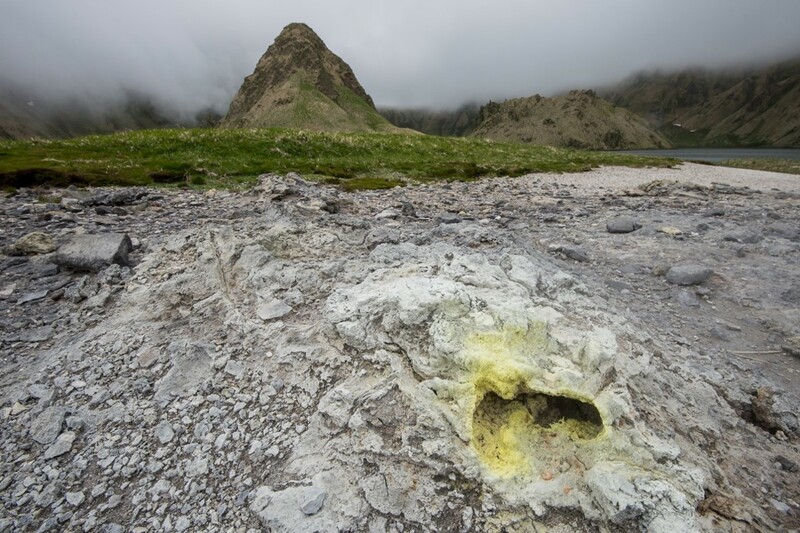 Inside the caldera the water was covered with auklets and both Crested …. …. and Whiskered could be found all over the rocks. 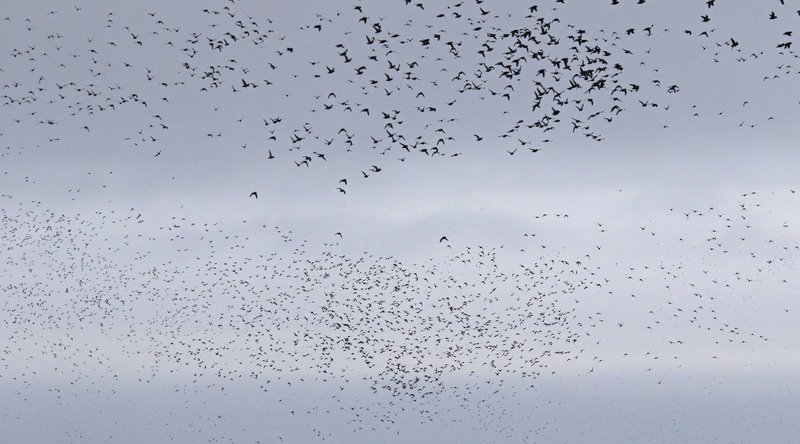 Ravens, Peregrines and at least six Arctic Foxes gathered to feast on the assembled auklets. The next day saw us zodiac cruising alongside a lava flow on Chirpoy Island. The lava front was slow-moving and the lava had cooled from red-hot to merely hot …. …. but even so the site of hot rocks tumbling into a caldron of boiling water was spectacular to say the least. The island of Urup will be best remembered for the hours it took to get a (poor) view of Japanese Robin, so I’ll gloss over that one and go on to talk about the next island, Iturup (above). 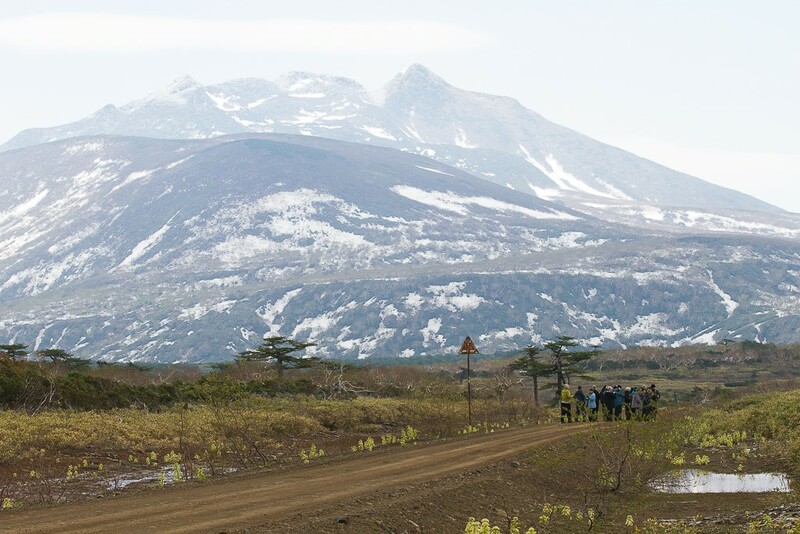 Unlike the other Kurils, Iturup is still inhabited and we were transported around the island in these big trucks, which was less than satisfactory as you couldn’t communicate with the driver and so couldn’t request a stop for birding …. …. but for the first time since boarding the ship we were able to get away from the coastal fringe. Unfortunately we didn’t have enough time to bird the area properly and although we heard a Japanese Accentor, we never saw it. 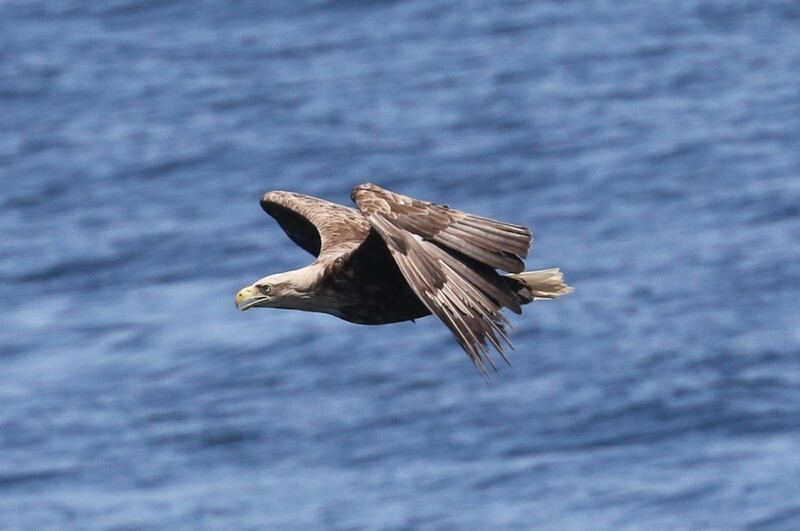 In the southern Kuril Islands, Steller’s Sea Eagles are largely replaced with the smaller, yet still spectacular, White-tailed Eagle. 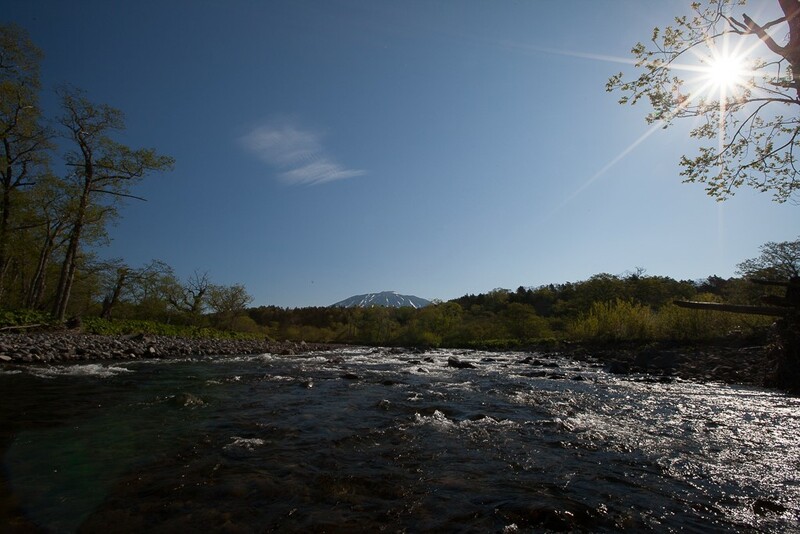 The southernmost island in the main Kuril chain is Kunashir. 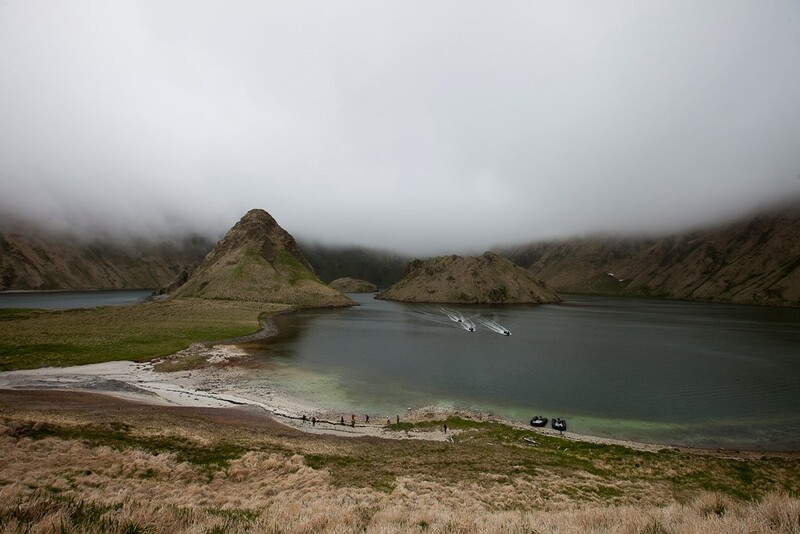 After the bleak conditions of Kamchatka, the Commander and northern Kuril Islands it seemed almost tropical. 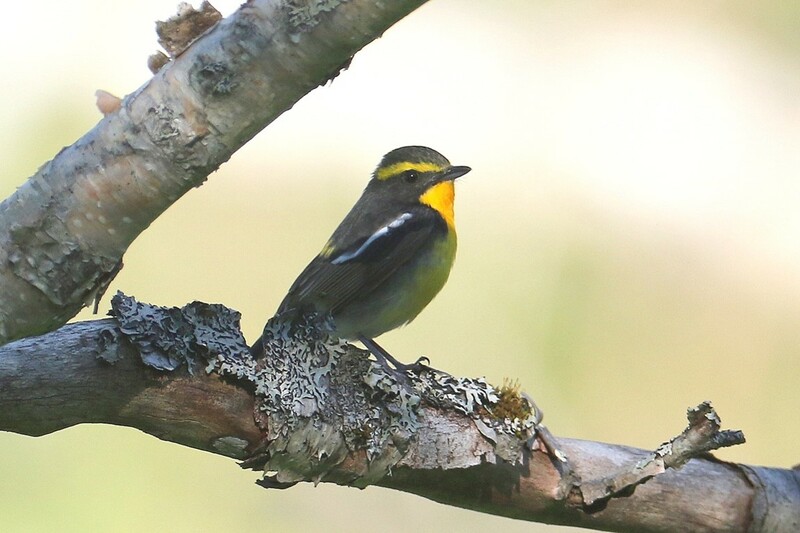 The mature forest held many more birds,such as this exquisite Narcissus Flycatcher, but also a lot of mosquitoes. 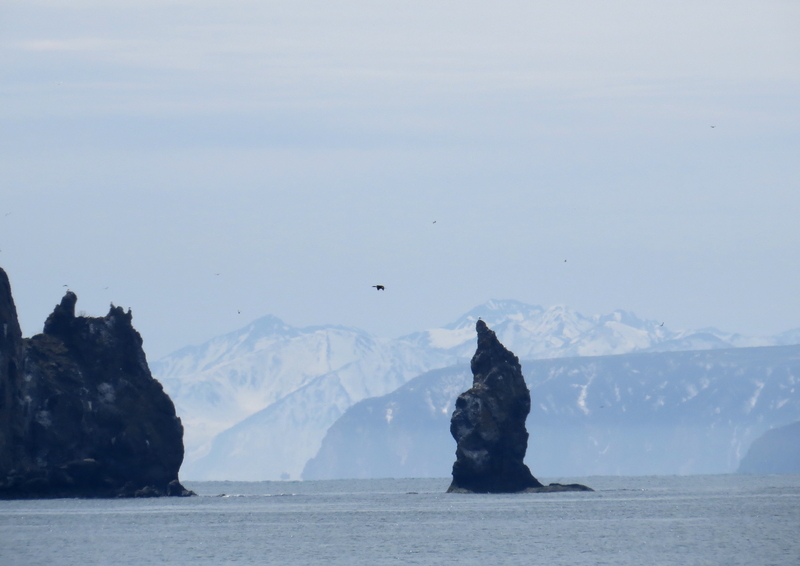 Quality birding continued as we sailed north across the southern Sea of Okhotsk bound for Sakhalin. 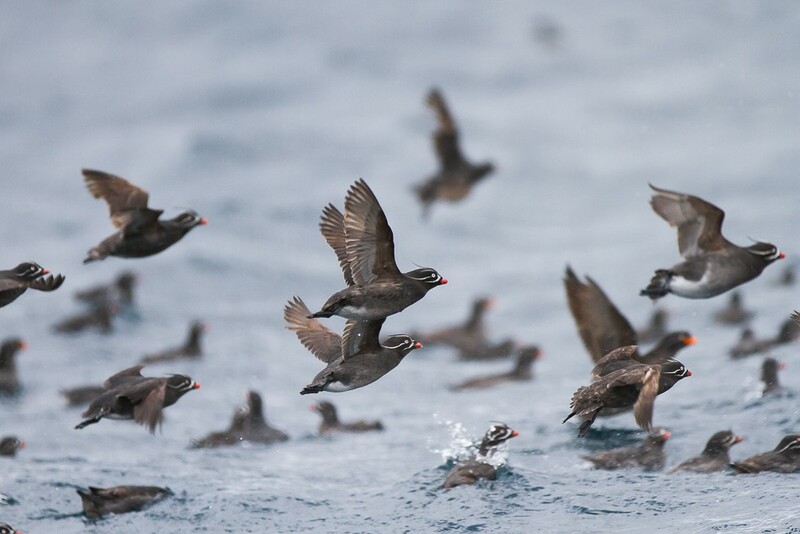 Large numbers of Short-tailed Shearwaters were seen, along with a few Pacific Divers (or Loons) and hundreds Rhinoceros Auklets (above). Most surprising was a few Japanese Murrelets, a species that has not been recorded on this itinerary before and presumably had been displaced northwards by the cyclone. On the morning of 8th June we docked at Yuzhno-Sakhalinsk and the cruise ended. Many passengers departed for flights that afternoon, but some of us had delayed our departure to be able to do some birding on Sakhalin. 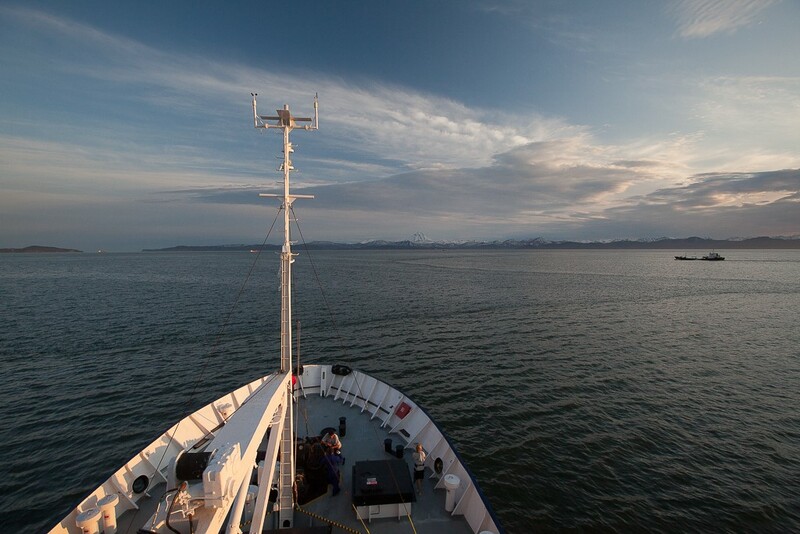 We were joined by passengers on the next cruise (around the Sea of Okhotsk) who had just arrived in Russia. 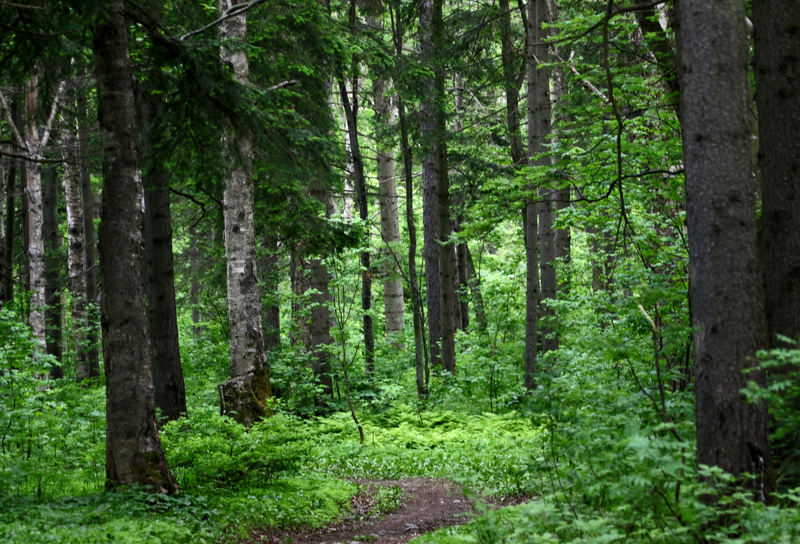 This woodland is in Gagarin Park (named in honour of the first man in space) which was immediately opposite our hotel. This photo and the next were taken by Ian Lewis. 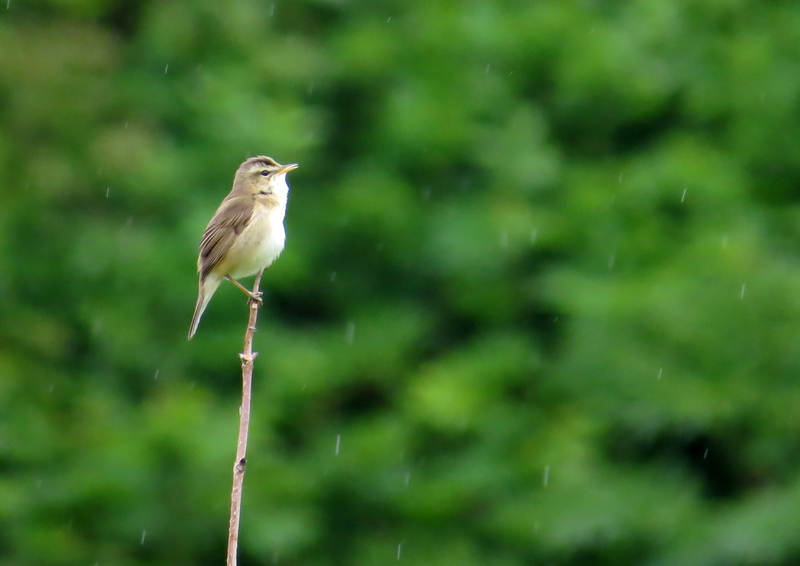 We were able to see the endemic Sakhalin Leaf Warbler (a species that may have occurred in Dorset) and Sakhalin Grasshopper Warbler, plus the super-elusive Rufous-tailed Robin, but it was only this Black-browed Reed Warbler that posed, in the rain, for photos. There were no flights on the 9th, I got to Moscow without difficulty on the 10th, but there was a major delay which meant I had to sleep in the airport overnight. I finally got home late on the 11th. Although there were some issues getting back and the weather was more like a British winter than what you would expect in June, I have to say that this was a most wonderful trip. 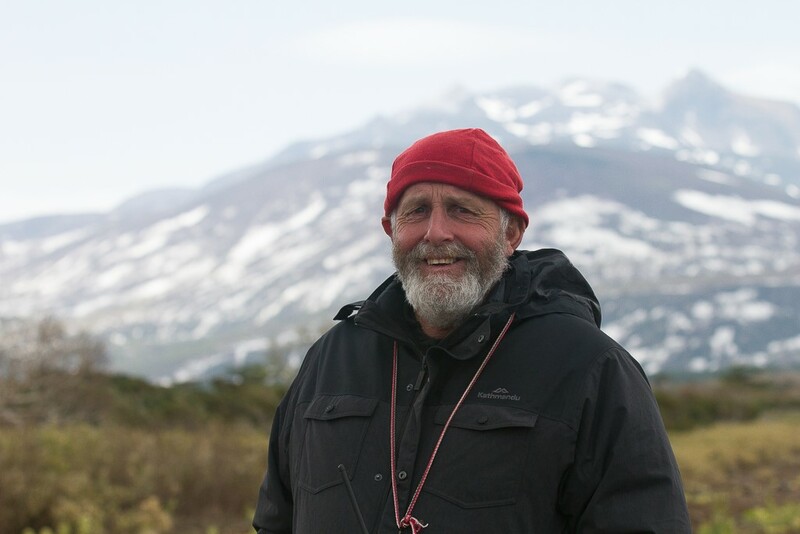 I would like to thank Rodney Russ (above) the owner of Heritage Expeditions and all his staff plus the crew of the Professor Khomov/Spirit of Enderby for a truly fantastic experience. Again a reminder that only seven of the above photos are mine and the rest were taken by Heritage Expedition staff. Once I have edited all my photos I hope to upload many to the blog but I know have quite a backlog! Hi Gryllosblog, I am trying to look up an old friend, Nigel Mackie and the internet search brings up only a visit with you a few years ago. If you have an email address or phone number for him, please could you let me have them. His home address would also work, I could always go knock on his front door. I’m in Leeds for a couple of months, visiting from the antipodes. My email adress is harthrob@paradise.net.nz. Many thanks in anticipation, Caroline Harkett. Your travels look truly amazing by the way!